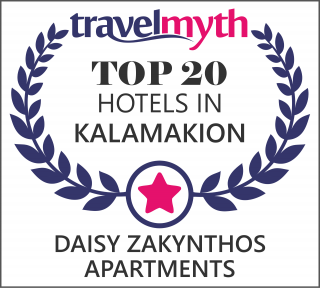 Kalamaki is one of the most famous tourist resorts of Zakynthos Island. It is renowned for its long beautiful sandy beach which the endangered Caretta Caretta turtle chooses as a nest area. It is protected by the National Marine Park so you can see the nests during the day and maybe even catch a glimpse of the freshly hatched turtles during the evening hours. The centre of Kalamaki has all amenities guests may need like traditional tavernas, restaurants, shops, a pharmacy, etc. 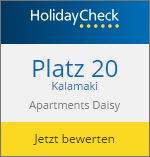 The Daisy Zakynthos Apartments are located 300m from the beach and just 50m from the centre. All major attractions like the National Marine Park, Laganas, Marathonisi Island also known as Turtle Island and Zakynthos town are located at convenient distances for guests to rent a vehicle or use the bus to explore them.